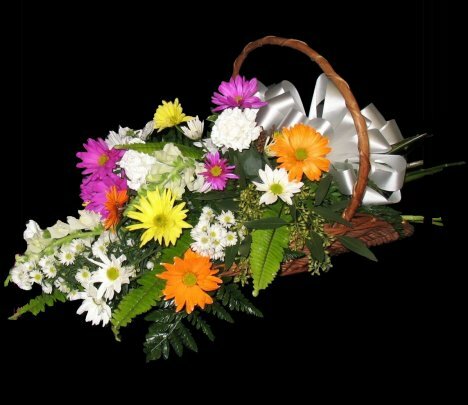 A fireside basket design is an open sided basket that can have the flowers coming out from all sides or looking as if you just picked the flowers from a meadow or flower garden with the flower heads on one sides and the stems on the opposite side. Keep in mind that this is an illusion, because flowers would not last long without a flower source. 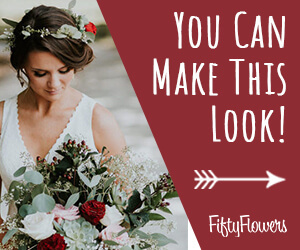 This tutorials takes you through the steps of creating a lovely "just picked" look, but has a hidden flower source. 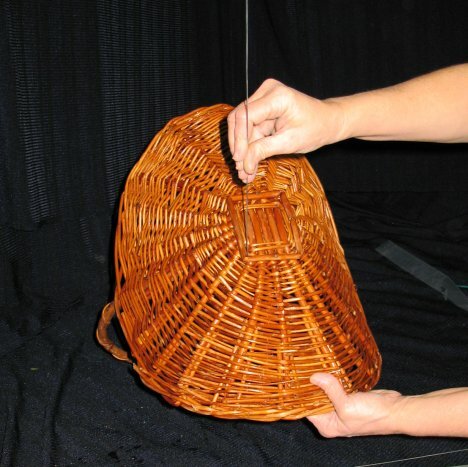 Using paddle wire, cut off about a two foot length to wire the foam to the basket. 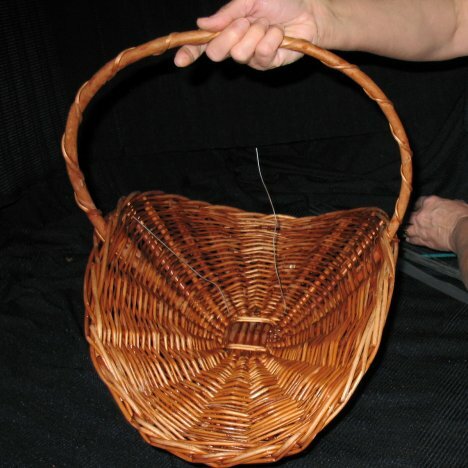 Wicker has natural open holes that you can take advantage of to secure the cage or container to the bottom of the basket. 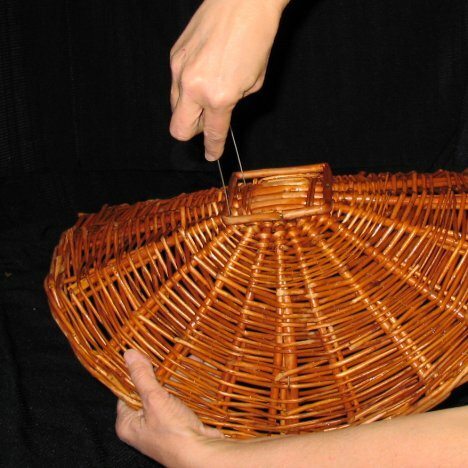 I doubled the wire into a large hairpin bend and then pushed the two cut ends through the bottom of the basket. Do the same for both sides. 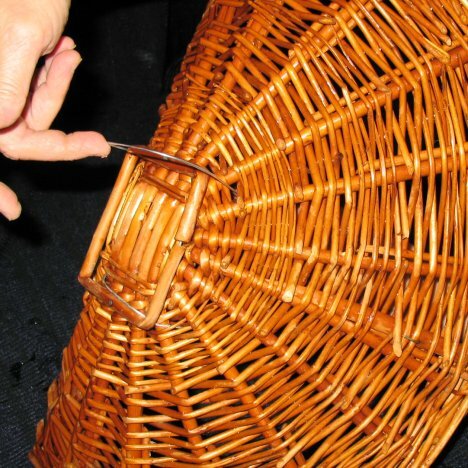 The wires that come through the inside of the basket will be what you'll use to secure the container to the basket. The length has to be long enough to wrap around your container or your foam cage. 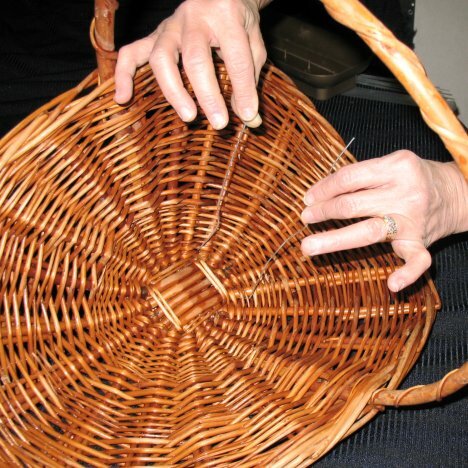 The wire on the bottom should be pushed firmly through so that it sets flat when the basket is placed on a hard surface. I used a cheap utility container that holds one full sized brick. You'll notice the container has plastic spikes coming up from the bottom. These spikes are to help the container keep a tight grip on the foam when pushed into it. 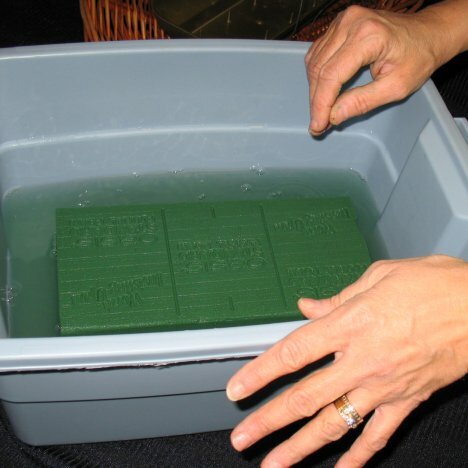 Always allow your Oasis foam to sink naturally into water that has been treated with a professional flower food like Crystal Clear. 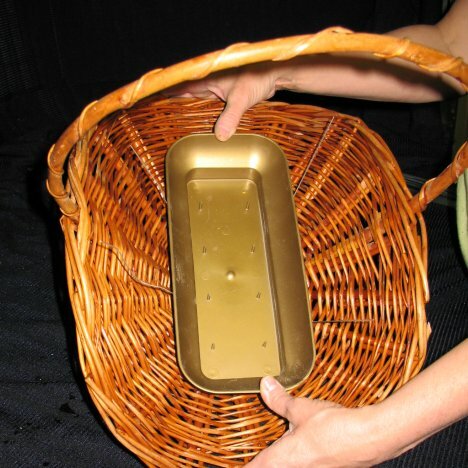 Forcing the brick under the water can cause dry pockets that can wilt flowers whose stems find that dry spot. 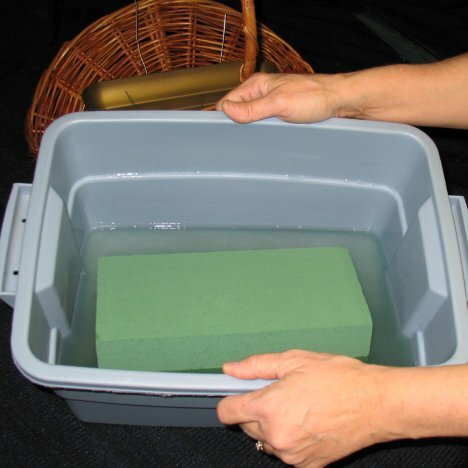 The brick absorbs quickly and will sink when it has absorbed all the water it can. You'll notice it gets very heavy. 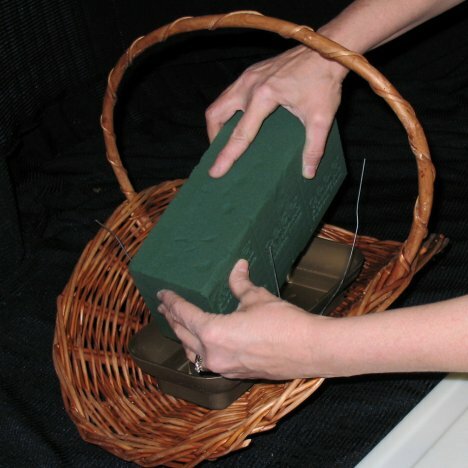 Placing the brick on it's side as shown, push it down firmly into the utility container. The foam will mold itself to the interior of the container. It's important the the sides of the Oasis foam is higher than the container. The stems of the greenery and the flowers is going to be pushed in from the sides and the top. If the foam was level or the container too deep, the flowers would stick upward unnaturally. It's much better and looks natural if the stems are inserted from the side.